I use them up the line when barbel fishing, to stop any weed that may hit my line from sliding down to the lead and my bait. See other pictures. You will get 20 sets of 6 in photo. Fits all line sizes, from 4 lbto 25 lb mono. also braid. 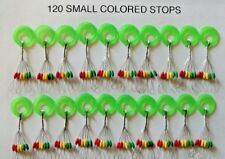 Nouvelle annonceOlentangy Spin-Casting Float & Stop Lot of 3 cards Fits no. 2 & no.4 Mono line. FLOAT & SLIP. Lot of 3 Cards. Instructions printed on back side of card. I have tested these on all line sizes 2-25 # and they worked great on all. Nouvelle annonceOlentangy Spin-Casting Float & Stop Lot of 5 cards Fits no. 6 & no. 8 Mono line. FLOAT & SLIP. Lot of 5 Cards. Instructions printed on back side of card. Slider for float fishing anti tangle plastic coupling. Slides independently up and down the line with quality clip for float. All the Rovex components are made using high quality materials and production processes to ensure strength and durability when fishing demanding saltwater venues. Size: For 1.0 - 3.0 fish line. Material: Rubber steel wire. You are buying, using and possessing this item at your own risk. Separate sub-line is not easy to tangle. Most orders are processed within 24 hours. Slider for float fishing anti tangle plastic coupling slides independently. quality clip for float. Will fit line sizes 3 through 25# mono and fluorocarbon. Fits all line sizes,including Braid. I have tested these on all line sizes 4-25 # and they worked great on all. These work with all line sizes. Beautiful multistriped hand painted slip floats. Packed with. bead and bobber stop in bag with How to instructions. 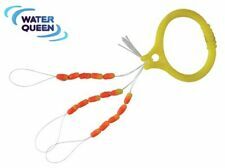 Each float has a line threader included. Floats designed to be balanced in the water. Bright epoxy paint that will not chip, seals the float, and will absorb water. John B Outdoors looks forward to serving you. Betts FW6 6" Cigar tubular style foam float. With bobber stop and bead. 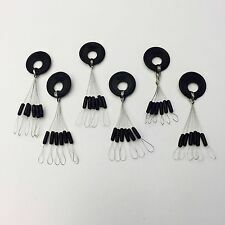 Pack of 5 budget waggled floats ideal for any beginner 5 random sizes please see photos Photos for mild description purposes Not self weighted Comes with 18 rig float stops free We only accept PAYPAL payment and ship to your PAYPAL address, please be sure it's a valid address before make payment. Payment should be completed within 7 days after auction ended. Or we have the right to cancel the transaction and relist it. Only After payment has cleared, we will post your items out within 1 working day not including weekends and Bank holidays. A must for use with all slip floats. John B Outdoors looks forward to serving you. Check-Out Now! Fishing Line. What happens after I have paid for my item?. We are located in Stuart Florida. Helpful Links. 8 INLINE BUBBLE FLOATS. set of quality inline bubble floats. Slider for float fishing anti tangle plastic coupling slides independently up and down the line with quality clip for float. 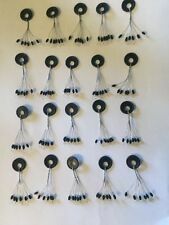 THESE CAN BE USED FOR RUN RIGS OR JUST WAGGLER FLOAT FISHING. Float Fishing, Drennan Piker 20 Gram Slip Floats, Set of 5 with Stops, Save! 5 DRENNAN PIKER 20 GRAM SLIP FLOATS. THESE TOP OF THE LINE FLOATS ARE SWEET. 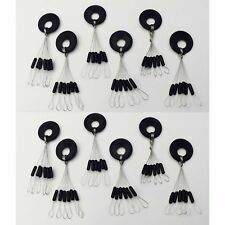 THEY ARE GREAT FOR STREAM OR LAKE FISHING. ALL OF OUR NATURAL RINGS ARE FACTORY SORTED AND GRADED. SEVERAL TYPES OF RINGS AND HANDLE WERE DESIGNED BY US AND MANUFACTURED TO OUR SPECIFICATIONS. 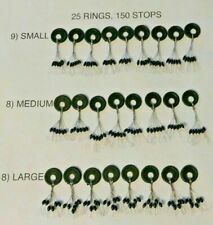 These bobber stops are recommended for line size 2 through 8. I have ran a test on line sizes up through 25 lb and they work great, so the recommendation is only for the size of the stop and the size of bobber your using not the size of line. You will receive 21 units x 6 on each for a total of 126 stops.